- Establishment of the Samanid Empire 875 C.E. Tajikistan, officially the Republic of Tajikistan, is a mountainous landlocked country in Central Asia. It borders Afghanistan to the south, Uzbekistan to the west, Kyrgyzstan to the north, and China to the east. An Islamic nation, it is home mainly to the Tajiks, who share culture and history with the Iranian people, and speak the Tajik language. After independence from the USSR, Tajikistan suffered from a devastating civil war which lasted from 1992 to 1999. About 50,000 people were killed, and 660,000 displaced, and all but 25,000 of the more than 400,000 ethnic Russians, who were mostly employed in industry, fled to Russia, taking with them much-needed skills. It was the poorest nation in Central Asia following the war, and at the beginning of the twenty-first century, two-thirds of its population continues to live below the poverty–line. Tajikistan has environmental problems resulting from the agricultural policies under Soviet rule. Herbicides have contaminated cotton and increased infant mortality. Increased irrigation spread contamination. Toxic industrial emissions have increased birth defects. Good governance will ensure moral development and social and economic growth and stability. The current situation of Tajikistan requires that active measures be taken to overcome political corruption as well as revive the economic system. The name “Tajikistan” means the “Land of the Tajiks." The word "Tajik" may come from the name of a pre-Islamic tribe, and means "crown" or "royalty." Tajikistan frequently appeared as Tadjikistan or Tadzhikistan in English, though when pronounced in English many Tajiks say "Tojikiston." 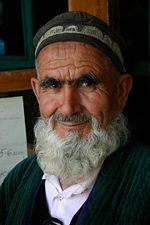 To distinguish between the nationality and the ethnicity, some sources use the adjective Tajikistani for the citizens of Tajikistan. With an area of 55,251 square miles (143,100 square kilometres), Tajikistan is the smallest nation in Central Asia by area. It is slightly smaller than Wisconsin in the United States. Its maximum east-to-west extent is 435 miles (700 kilometers), and its maximum north-to-south extent is 217 miles (350 kilometers). The Pamir-Alay mountain system covers more than 50 percent of the country and is over 10,000 feet (3000 meters) above sea level. 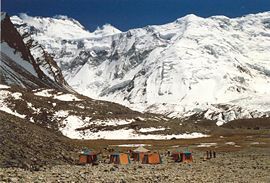 That system includes two of the three highest elevations in the former Soviet Union: Lenin Peak at 23,405 feet (7134 meters) and Ismail Samani Peak at 24,589 feet (7495 meters). The mountains contain numerous glaciers, the largest of which, Fedchenko Glacier, covers more than 270 square miles (700 square kilometers) and is the largest glacier in the world outside the polar regions. The only areas of lower land are in the north, which is part of the Fergana Valley, the most densely populated region in Central Asia, which spreads across northern Tajikistan from Uzbekistan on the west to Kyrgyzstan on the east, and in the southern Kafirnigan and Vakhsh valleys, which form the Amu Darya and have much higher rainfall. Rivers bring rich soil deposits into the Fergana Valley from the surrounding mountains, creating a series of fertile oases prized for agriculture. The largest rivers are the Syr Darya and the Amu Darya. The Amu Darya and Panj rivers mark the border with Afghanistan, and Tajikistan's mountains are the major source of water for the Aral Sea. Tajikistan’s second largest river, the Vakhsh, was dammed at several points for irrigation and electric power generation, most notably at Norak (Nurek), east of Dushanbe, where one of the world's highest dams forms the Norak Reservoir. Numerous factories were built along the Vakhsh. Most of Tajikistan's lakes are of glacial origin and are located in the Pamir region. The largest, the Qarokul, is a salt lake devoid of life, lying at an elevation of 13,780 feet (4200 meters). The capital city Dushanbe, formerly Dyushambe or Stalinabad, with a population of 562,000, is located on the southern slopes above the Kafirnigan valley. The name is derived from the Persian word for "Monday" and refers to the fact that it was a popular Monday marketplace. The second largest city is Khujand, situated on the Syr Darya river at the mouth of the Fergana Valley, with a population of 149,000. 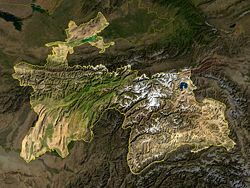 Tajikistan's climate is continental, subtropical, and semiarid, with some desert areas. The climate changes drastically according to elevation. The Fergana Valley and other lowlands are shielded by mountains from Arctic air masses, but temperatures in that region still drop below freezing for more than 100 days a year. In the subtropical south-western lowlands, which have the highest average temperatures, the climate is arid, although some sections now are irrigated for farming. At Tajikistan's lower elevations, the average temperature range is 73°F to 86°F (23°C to 30°C) in July and 30°F to 37°F ( -1° to 3°C) in January. In the eastern Pamirs, the average July temperature is 41°F (5°C), and the average January temperature is 5°F to –4°F (-15° to -20°C). Tajikistan is the wettest of the Central Asian republics, with the average annual precipitation for the Kafiristan and Vakhsh valleys in the south being around 20 to 24 inches (500mm to 600mm), and up to 60 inches (1500mm) in the mountains. At the Fedchenko Glacier, as much as 88 inches (2236mm) of snow falls each year. Most precipitation occurs in the winter and spring. Because Tajikistan lies in an active seismic belt, severe earthquakes are common. A photograph of Ismail Samani Peak (then known as "Peak Communism") taken in 1989 when Tajikistan was part of the Soviet Union. Tajikistan has environmental problems resulting from the agricultural policies under Soviet rule. DDT, banned by international convention, and several defoliants and herbicides, have contaminated the cottonseeds whose oil is used widely for cooking. Cotton farmers and their families are at particular risk from agricultural chemicals, both from direct physical contact in the field and from the use of the branches of cotton plants at home for fuel. These toxic sources are believed to contribute to a high incidence of maternal and child mortality and birth defects. In 1994 the infant mortality rate was 43.2 per 1000 births, the second highest rate among former Soviet republics. The rate in 1990 had been 40.0 infant deaths per 1000 births. Cotton farms were established in large, semi-arid tracts, but cotton's growing season is summer, when the region receives virtually no rainfall. The 50 percent increase in cotton cultivation mandated by Soviet and post-Soviet planners between 1964 and 1994 overtaxed the water supply. Poorly designed irrigation networks led to massive run-off, which increased soil salinity and carried toxic agricultural chemicals downstream to other fields, the Aral Sea, and populated areas of the region. As the desiccation of the Aral Sea came to international attention in the 1980s, water-use policy became a contentious issue between Soviet republics such as Tajikistan, where the main rivers rise, and those farther downstream, including Uzbekistan. The aluminum plant at Regar, west of Dushanbe near the border with Uzbekistan, generates large amounts of toxic waste gases that have been blamed for a sharp increase in the number of birth defects among people who live within range of its emissions. In 1992 the Supreme Soviet of Tajikistan established a Ministry of Environmental Protection. However, enforcement was limited by political upheaval. The land that is now Tajikistan has been inhabited continuously since 4000 B.C.E. Sogdiana, Bactria, Merv and Khorasan were the four principal divisions of ancient Central Asia inhabited by the ancestors of the present-day Tajiks, who are now found only in historic Bactria and Sogdiana. Bactria was located in northern Afghanistan between the Hindu Kush mountain range and the Amu Darya river, and some areas of south Tajikistan. Bactria was a center of various kingdoms or empires, and is probably where Zoroastrianism originated. During the Achaemenid period (550 B.C.E. to 329 B.C.E. ), Sogdiana was a province of the Persian Empire. Tajikistan cities Panjakent and Istarawshan were founded in that period. After Alexander the Great defeated the Persian Empire in 333 B.C.E., Bactria, Sogdiana and Merv, being part of Persian Empire, had to defend themselves. Sogdian ruler Spitamenes resisted Alexander, who married Roxanne, the daughter of a local ruler, in 327 B.C.E., and inherited the land. After the collapse of the Macedonian Empire, Macedonian generals continued to rule for another 200 hundred years in what are known as the Macedo-Bactrian kingdoms. During this time, from 90 B.C.E. to 30 B.C.E., the Eastern Scythians destroyed the last Macedonian successor states and, together with the Tocharians, (to whom they were closely related) created a Kushan Empire around 30 C.E. Until 410 C.E., the Kushan Empire would be a power in the region along with Roman, Parthian empire and Han empire (China). At the end of the Kushan period the empire became much smaller and had to defend itself from powerful Sassanid empire that replaced the Parthian empire. The famous Kushan Shah Kanishka promoted Buddhism and during this time Buddhism was exported from Central Asia into China. The Hephthalites, another Scythian-related tribe, ruled from 410 until 565 when they were destroyed by a combination of Sassanid and Göktürk forces. The Göktürks ruled from 565 to 658. Beginning in 651, the Arabs raided deep into Transoxania. In 715, the entire region thus came under the control of the Caliph and of Islam, ruled through local Soghdian Kings and dihqans. Abbasid control of the Caliphate (750 - 1258) established a huge multi-ethnic centralized state, giving the Near East and Transoxiana a unity that had been lacking since the time of Alexander the Great. Islam spread rapidly in Transoxiana, with its promise of greater social mobility and favorable conditions for trade. With Islam came the Arabic language that had become the language of Abbasid court. 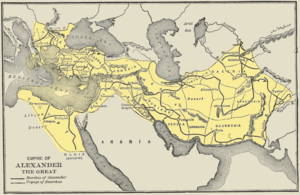 The Samanid Dynasty, which ruled from 819 to 1005 in Khorasan (Eastern Iran) and Transoxiana, was one of the first purely indigenous dynasties to rule in Persia following the Muslim Arab conquest. Not until the reign (892 to 907) of founder Saman-Khuda's great-grandson, Ismail I, did Samanid power become extensive. In 900, Ismail defeated Saffarids in Khorasan (to become north-west Afghanistan and north-eastern Iran), while his brother was the governor of Transoxiana. The cities of Bukhara (the Samanid capital) and Samarkand became centers of art, science, and literature. Industries included pottery making and bronze casting. Many scholars of this period are still very highly regarded, notably Ibn Sina (Avicenna). The modern state of Tajikistan considers that the Tajik name and identity, although in existence for thousands of years in this area, began its formation during the Samanid period. After 950, Samanid power weakened. With the oncoming encroachment of Muslim Turks into the Abbasid Empire, the Samanids were defeated in 999. Genghis Khan and his Mongol tribes swept through Central Asia in 1220. The region fell under the control of a succession of rulers of the Mongolian Golden Horde, the western branch of the Mongol Empire. The horde, or zhuz, is the precursor of the present-day clan. The land that comprises Tajikistan became a part of the emirate of Bukhara. In the 1300s, Timur (1336 to 1405), known in the West as Tamerlane, overpowered the Mongols and built his own empire, centered in Samarkand. In his military campaigns, Tamerlane reached as far as the Middle East. He defeated Ottoman Emperor Bayezid I and rescued Europe from Turkish conquest. The Timurid Empire lasted from 1370 to 1506, when the last Timurid ruler of Herat, Badi az Zaman, fell to the armies of the Uzbek Muhammad Shaibani Khan. Shaybanid rule lasted from 1506 to 1598, the Astrakhanid (Janid) dynasty lasted from 1598 to 1740, and the Afsharid dynasty lasted from 1740 to 1756. An ancient Zoroastrian temple in the Wakhan Valley, Tajikistan. In the nineteenth century, the Russian Empire began to spread into Central Asia during the Great Game, a period generally regarded as running from approximately 1813 to the Anglo-Russian Convention of 1907, during which Britain and Tsarist Russia competed for influence in Central Asia. Conflict with Russia started in 1865, shortly after Russian conquest of Tashkent. Being more technologically advanced, the Russians had little difficulty in conquering the regions inhabited by Tajiks, meeting fierce resistance only at Jizzakh, Ura-Tyube, and when their garrison at Samarkand was besieged in 1868 by forces from Shahr-e Sabz and the inhabitants of the city. The army of the Emirate of Bukhara was defeated in three battles. Samarkand and the Upper Zeravshan were annexed by Russia and the country was opened to Russian merchants. The emir retained his throne as a vassal of Russia and made up his territorial losses by establishing, with Russian help, control over Shahr-e Sabz, and the mountainous regions in the upper Zeravshan Valley in 1870, and by annexing the principalities of western Pamir in 1895. At the end of August 1920 the last emir, Sayyid Alim Khan, was overthrown as a result of the invasion by Soviet troops, and the Bukharan People's Soviet Republic proclaimed. After the overthrow of the Tsar in 1917, guerrillas throughout Central Asia, known as basmachi waged a war against Bolshevik armies in an attempt to maintain independence. The Bolsheviks would prevail after a four-year war, in which mosques and villages were burned down. Soviet authorities imposed a draconian secularization campaign, practicing Muslims, Jews, and Christians were heavily persecuted, and mosques, churches, and synagogues were closed. In 1924, the Tajik Autonomous Soviet Socialist Republic was created as a part of Uzbekistan, but in 1929 the Tajik Soviet Socialist Republic was made a separate constituent republic. Moscow did little to develop Tajikistan, and it lagged behind other Soviet republics in living conditions, education and industry. In the 1970s, dissident Islamic underground parties began to form and by the late 1980s Tajik nationalists were calling for increased rights. Real disturbances did not occur within the republic until 1990. Tajikistan plunged into civil war. The rise of Tajik nationalism and Islamic fundamentalism coupled with political struggles between the ruling elite and the opposition were all factors. On April 7, 1990, the Soviet Union passed a law allowing republics to leave the union if two thirds of their voters wished to. Tajiks became politically active and an independence movement, known as Opposition, emerged. Mass protests in Dushanbe forced president K. Makhkamov to resign in August of 1991. Independence was declared on September 9, 1991, and a coup installed Nabiyev as president. Nationalism and anti-Russian feeling intensified, leading to a state of emergency and the suppression of opposition parties. Civil war broke out in 1992, between old-guard regionally based ruling elites and disenfranchised regions, democratic liberal reformists, and Islamists loosely organized as the United Tajik Opposition (UTO). 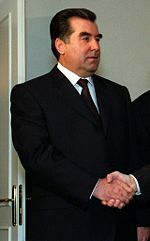 Emomali Rahmonov came to power in 1992. The height of hostilities occurred between 1992-1993. By 1997, the predominantly Kulyabi-led Tajik government and the UTO successfully negotiated a power-sharing peace accord. Peaceful elections were held in 1999. Rahmonov was re-elected by almost unanimous vote. As a result of the war, about 50,000 people were killed, and 660,000 displaced, and all but 25,000 of the more than 400,000 ethnic Russians, who were mostly employed in industry, fled to Russia, taking with them much-needed skills. Meanwhile, conflict increased between Tajikistan and Uzbekistan, which fears Islamic radicalism. In 2000, Uzbekistan planted landmines along the border. A dispute with China over the Gorno-Badakhshan region brought military tension. Russian troops were stationed in southern Tajikistan, in order to guard the border with Afghanistan, until summer 2005. Since the September 11, 2001 terrorist attacks in the United States, American and French troops have been stationed in the country. Rahmonov was still in power in 2007. Tajikistan is officially a republic, and holds elections for the president and parliament. The president, Emomali Rahmonov since November 1994, is head of state and chairman of the Supreme Assembly. The president is elected by popular vote for a seven-year term, and is eligible for a second term. An election was last held in November 2006, in which Rahmonov took 79.3 percent of the vote. The president appoints the council of ministers (cabinet), which is approved by the Supreme Assembly. The prime minister is head of government. Okil Okilov held that position in 2007. The bicameral Supreme Assembly, or Majlisi Oli, consists of the Assembly of Representatives (lower chamber) or Majlisi Namoyandagon, which has 63 members elected by popular vote to serve five-year terms, and the National Assembly (upper chamber) or Majlisi Milliy, which has 34 indirectly elected members—25 selected by local deputies, eight appointed by the president, and one seat reserved for the former president. All serve five-year terms. Tajikistan to this date is one of the few countries in Central Asia to have included an active opposition in its government. In the parliament, opposition groups have often clashed with the ruling party, but this has not led to great instability. International observers have noted elections fail to meet international standards, arousing accusations from opposition parties that Rahmonov manipulates the election process. "Mainline" opposition parties, including the 23,000-member Islamic Renaissance Party, boycotted the November 2006 election. Four remaining opponents all but endorsed the incumbent. The 2005 parliamentary elections brought increased closures of independent and opposition newspapers and attacks on journalists. In 2003, the government blocked access to the only internet website run by the political opposition. Under the Supreme Court, there are national and local courts. Supreme Court judges are appointed by the president. A Higher Economic Court, to handle economic disputes, has existed since 1997. Judges of that court are pressured by the executive, warlords, and organized crime. Judges of all courts there are poorly trained and often accept bribes. Constitutional guarantees of a fair trial are not always observed, and torture is allegedly used against accused suspects. Pre-trial detention can be lengthy, and prosecutors control court proceedings. Prisons are overcrowded, and the incidence of tuberculosis and malnutrition is high among inmates. Violence against women is frequent, and Tajikistan is a source and transit point for trafficking in women. Narcotics smuggling is widespread. Unregistered guns remained widely available after the civil war. Violent crime, official corruption and white-collar crime have all increased. Tajikistan consists of four administrative divisions: two provinces (Sughd and Khatlon), one autonomous province (Gorno-Badakhshan), and the Region of Republican Subordination (formerly known as Karotagin Province). Each region consists of several districts (called "nohiya"). Communities are divided into mahallas (neighborhoods) which are governed by respected elderly persons. Tajikistan's armed forces consist of the army, air force, air defense forces, presidential national guard, and security forces (internal and border troops), as well as Russian forces, principally the 201st Motor Rifle Division. Military expenditure is 3.9 percent of GDP. The government has been criticized for anti-Semitism. In 2006, the government began demolition of the last remaining synagogue in the country, which was serving the small Bukaharan Jewish community, as well as their ritual bath, kosher butcher, and classrooms, to make room for a new presidential residence. Tajikistan belongs to the Economic Cooperation Organization. Tajikistan has one of the lowest per capita GDPs among the 15 former Soviet republics. Only six percent of the land area is arable, and cotton is the most important crop. Mineral resources are varied but limited in amount, and include silver, gold, uranium, and tungsten. Industry consists only of a large aluminum plant, hydropower facilities, and small obsolete factories mostly in light industry and food processing. Rural people subsist on what they produce themselves. Most households grow their own food. City dwellers plant gardens in vacant lots. The civil war, from 1992-1997, severely damaged the already weak economic infrastructure and caused a sharp decline in industrial and agricultural production. In 2000, international assistance remained an essential source of support for rehabilitation programs that reintegrated former civil war combatants into the civilian economy, thus helping keep the peace. International help was necessary to address the second year of severe drought that resulted in a continued shortfall of food production. 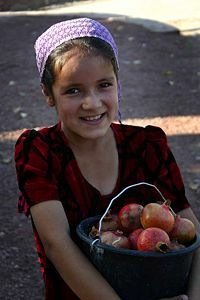 While Tajikistan has experienced steady economic growth since 1997, nearly two-thirds of the population continue to live in abject poverty. Economic growth reached 10.6 percent in 2004, but dropped to 8 percent in 2005, and to 7 percent in 2006. Tajikistan's economic situation, however, remains fragile due to uneven implementation of structural reforms, weak governance, widespread unemployment, and the external debt burden. Legislation in 1992, gave citizens the right to own, lease, and inherit land. The state owns all agricultural land, but the land can be leased. Leases can be sold and inherited. In the Soviet era, the government owned all businesses. Legislation enabled the transfer of state-owned businesses to public ownership. However, privatization requires ministry approval, and officials often refuse to cooperate. Government officials are usually offered bribes. Continued privatization of medium and large state-owned enterprises could increase productivity. A debt restructuring agreement was reached with Russia in December 2002, including a $250-million write-off of Tajikistan's $300-million debt to Russia. Tajikistan ranks third in the world in terms of water resources per head. A proposed investment to finish the hydropower dams Rogun and Sangtuda I and II would substantially add to electricity production, which could be exported for profit. If finished, Rogun will be the world's tallest dam. In 2006, Tajikistan was the recipient of substantial infrastructure development credits from the Shanghai Cooperation Organization to improve its roads and electricity transmission network. To help increase north-south trade, the United States is constructing a $36-million bridge linking Tajikistan and Afghanistan. Exports totalled $1.16-billion in 2006. Export commodities included aluminum, electricity, cotton, fruits, vegetable oil, and textiles. Export partners included Netherlands 46.6 percent, Turkey 15.8 percent, Russia 9.1 percent, Uzbekistan 7.3 percent, Latvia 4.9 percent, and Iran 4 percent. Imports totalled $1.513-billion in 2006. Import commodities included electricity, petroleum products, aluminum oxide, machinery and equipment, and foodstuffs. Import partners included Russia 19.3 percent, Kazakhstan 12.7 percent, Uzbekistan 11.5 percent, Azerbaijan 8.6 percent, China 7 percent, Ukraine 6.2 percent, Romania 4.6 percent, and Turkmenistan 4 percent. Unemployment was 12 percent in 2004, and 64 percent were below the poverty line. GDP per capita was $1388 in 2005, and the per capita rank was 159 out of 181 countries. The Tajik people are of Persian descent and made up about 65 percent of the population of 7,320,716 in 2006. Within this group are about 40,000 Pamiris, who live in the Gorno-Badakhshan Autonomous Province, which is surrounded by mountains, and is isolated for most of the year. The Yaghnobis and Shugnanis, who live in the Northern region around the Zeravshan valley, descend from Sogdiana people, and speak a dialect of the Sogdian language. Other ethnic groups caught within the country when the Soviet Union arbitrarily re-drew borders include Uzbeks, Kyrgyz, Turkmen, Kazakhs, and Uyghur. A small community of Jews, displaced from the Middle East after the Babylonian captivity, migrated to the region and settled there after 600 B.C.E., though the majority of Jews did not migrate to Tajikistan until the twentieth century. Many Russians migrated to the area as soldiers and laborers from the eighteenth century. Other non-indigenous ethnic groups include Crimean Tartars, Ukrainians, Belorussians, Georgians, Osetians, Koreans, and Armenians. Clan affiliation is strong. The Khojand clan in the north is identified with hard-line communism. The pro-Russian Kulab clan gained control of the government after a power struggle in 1994. The Garm clan of the Gorno-Badakhshn region is a stronghold of the Islamic Renaissance movement. Life expectancy for the total population was 64.37 years in 2003. 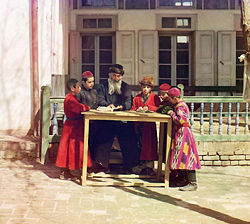 Jewish students with their teacher in Samarkand, ca. 1910. Zoroaster, the prophet of Zoroastrianism, was born in the Balkh area, (northern Afghanistan and Transoxania) and was possibly Bactrian. Zoroastrianism had been adopted by Persian emperors as a state religion and was practiced during the Samanid era in central Asia until being overrun by the Arabs in the seventh century. Islam, the predominant religion of all of Central Asia, became an integral part of Tajik culture. Soviet efforts to secularize society were largely unsuccessful, and the post-Soviet era has seen a marked increase in religious practice. Approximately 85 percent of Muslim inhabitants are Sunni, and 15 percent are Shi'a, 40 percent of whom are Ismailis. Most of them reside in the remote Gorno-Badakhshan region as well as certain districts of the southern Khatlon region and in Dushanbe. The most important form of Sufism, described as Islamic mysticism, in Tajikistan is the Naqshbandiyya, a Sufi order with followers as far away as India and Malaysia. Among other religions, the Russian Orthodox faith is the practiced by the remaining Russians living there. There also is a small Jewish community. When the Soviet Union increased tolerance, new Islamic spokesmen emerged. In 1990, Muslims from various parts of the union organized the Islamic Rebirth Party. 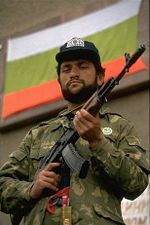 The growth of mass political involvement among Central Asian Muslims prompted the communist old guard invoked fears that fundamentalist Muslims would destabilize the Tajikistani government. Tajiki, which is closely related to Farsi, is the official and the most widely used language. Villagers speak regional dialects and have only a basic understanding of the official language. Pamiri languages have kept characteristics of ancient Iranian. Russian is largely spoken in business and for government purposes, and Uzbeki is used in the Khujand region. The constitution gives men and women equal rights, and women work in government, academic institutes, and enterprises. But only 27 percent of women are leaders or directors, and women earn about 66 percent the salary of men for the same work. Men control politics and religion, and are the breadwinners, and protectors of women. A man cannot enter a home occupied only by women, and a girl cannot be left alone with a boy. Men and women are separated at large social gatherings. A marriage sanctified by a religious ceremony is important in Tajikistan. A matchmaker may be involved in choosing a bride, whose parents study the groom's education, lifestyle, and economic situation.. The wedding feast includes music, dancing, and poetry. A bride’s representative brings a tray filled with burning herbs to banish illness and the evil eye. The wedding bed is prepared for the first night. The purity of the bride must be proved to her mother-in-law. The bride moves to her husband's family home. Infants may be promised for marriage. Cousins may marry, although marriage between the children of brothers is viewed as bad financially. Polygyny is illegal, but may account for 20 percent of all marriages. After the age of 23, a woman is considered suitable only as a second wife. Divorce is rare, and for Muslims, marriage to a non-Muslim is disapproved of. Large families are common, and the family often includes the parents of the husband. The youngest son, and his family, stays with his parents, cares for his parents in their old age, and inherits the family home. The elderly father is the head of the house. The elderly mother has authority over her daughter-in-law, to whom her personal belongings go after her death. Members of kin groups, that include the grandchildren of a great-uncle, live closely together, and share household items. The oldest and wisest men lead the kin group. A baby is kept away from people other than immediate family for its first 40 days until a cradle ceremony and a feast is held. This is a coming of age for the mother, who becomes a woman upon the birth of a child, and who often nurses an infant until the age of two. Boys are circumcised between the ages of one and seven. Daughters are taught how to cook, clean, and sew. Sons learn to work in the fields, and provide for a family. All children are taught respect for the elderly and obedience to parents. Soviet rule brought a modern educational system and a high degree of literacy, estimated at 99.4 percent in 2003. Education is compulsory for nine years and is undertaken between ages seven and 17. Tajik is the main language of instruction. The curriculum includes the Tajik language and classical Persian literature. After independence, the education completion rate fell. Many people do not value formal education, in the belief that a child's responsibility to the family takes precedence. There are around 24 university-level institutes in the country. The most notable is Tajik State National University in Dushanbe, which emphasizes history, philology, and economic planning, and the Polytechnic Institute in Dushanbe, which offers training in energy, architecture, and mechanical engineering. Education spending in 2001 was 3.7 per cent of total government expenditure. Urban residents have the highest social status, especially those who work in the government and international organizations. Bankers, company directors, intellectuals, and professionals follow. Workers and peasants are at the bottom. Military and religious leaders have high status, although they may not be wealthy. People in the cities wear Western fashions, while villagers dress more traditionally. Modern Tajiks proudly view the Persian Samanid Empire as the first Tajik state. 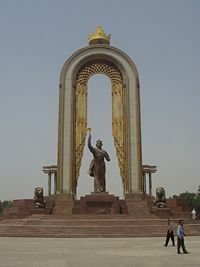 This monument located in Dushanbe honors Saman Khuda, ancestor of the Samanids. The culture of Tajikistan has developed over several thousand years. Tajiks and Persians come from similar stock with a mutual language and are related as part of the larger group of Iranian peoples. Tajik culture can be divided into two areas, Metropolitan and Kuhiston (Highland). Ancient towns such as Bukhara, Samarkand, Herat, Balkh and Nishopur Khiva are no longer part of the country. More modern centers include Dushanbe (the capital), Khudjand, Kulob, Panjikent and Istarvshan. The culture emphasizes hospitality, humility, and respect. The elderly are always honored. When shaking hands, one should place the left hand over the heart and bow. Bargaining at the market is accepted. Personal space is not respected. A rule-breaker may be ostracized. Under Soviet rule, functional government office buildings, cultural facilities, and apartment blocks similar to those throughout the Soviet Union were built. More recent architecture emphasizes Samanid baked brick, used in mosques, minarets, and mausoleums, with calligraphic inscriptions on walls, and fourteenth century Timurid mosaic tile. With 64 percent living below the poverty line, food is scarce. Breakfast consists of tea and bread, with butter and jam and perhaps eggs or porridge for wealthy people. Dinner may be soup containing meat, carrots, onions, and potatoes. Osh, a rice dish made with carrots, onions and meat, is popular, as is pasta, meat- and onion-filled pastries, and tomato and cucumber salads. Round flat bread, which may not be placed upside down or wasted, accompanies all meals. Pork is never eaten. Tea is served to the host first to show that it is safe to drink. Islamic law prohibits alcoholic drinks, a ban that is often ignored. Tajiks in Tajikistan describe all of the major literary works written in Persian until the twentieth century as Tajik, regardless of the ethnicity and native region of the author. In Soviet times, such claims were a strategy to permit Tajiks some contact with a culture that was artificially divided by state borders. 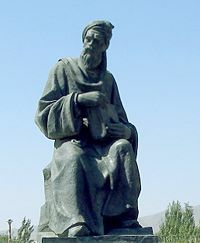 Rudaki is considered a founder of Persian literature. He was born in Rudak, a village in Transoxiana, in 870, in what is now Panjakent. Most of his biographers assert that he was blind, but the accurate knowledge of colors shown in his poems makes this doubtful. He was the court poet to the Samanid ruler Nasr II (914-943) in Bukhara, but he eventually fell out of favor and ended his life in poverty. Three writers dominated the first generation of Soviet Tajik literature. Sadriddin Aini (1878-1954), a Jadidist writer and educator who turned communist, began as a poet but wrote primarily prose in the Soviet era. His works include three novels dealing with social issues in the region and memoirs that depict life in the Bukhoro Khanate. Abu'l-Qasem Lahuti (1887-1957) was an Iranian poet who emigrated to the Soviet Union for political reasons and eventually settled in Tajikistan. He wrote both lyric poetry and "socialist realist" verse. Another poet, Mirzo Tursunzoda (1911-1977), collected Tajik oral literature, wrote poetry of his own about social change in Tajikistan, and turned out various works on popular political themes of the moment. Since the generation that included those three writers, Tajikistan has produced numerous poets, novelists, short story writers, and playwrights. Other writers include: Pairav Sulaimoni, Sadri Ziyo, Sotym Ulughzoda, Laiq Sher-Ali, Bozor Sobir, and Muhammadjon Shukurov. Soviets introduced modern drama, opera and ballet. Since independence, there has been a pre-Soviet cultural revival in an attempt to foster a sense of national identity. Novelist Taimur Zulfikarov and professors Rahim Masov and Bozor Sobir are prominent. Tajik music is closely related to Central Asian forms. The classical music is shashmaqam, which Uzbeks took over and developed. Tajik folk music is traditionally divided into three styles, Pamir, Central Kuhistoni, and Sogdiana's northern style. The latter is part of the same musical culture as the adjacent regions of Uzbekistan. There are work songs, music for ceremonies, funerals, weddings and musical epics, especially the central Tajik heroic legend Gurugli. There is music for holidays. Gulgardoni, a springtime holiday, includes carolling celebratory songs accompanied by the dutar and doira. Sayri Guli Lola, the “holiday of tulips,” includes accompanied choir and dance music. The birth of a child is cause for special music. Traditional puppeteers play on the doira, qayroq, surnay and nag'ora. There are other variations, and folk songs like Naat and Munojot, performed at the circumcision ceremony of a male child. Traditional Tajik wedding music is played by sozanda, professional musicians, mostly female, who are part of ensembles called the dasta. Southern Tajikistan has a distinctive form of folk music called falak, which is played at celebrations for weddings, circumcisions and other occasions. 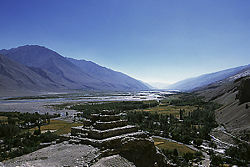 Badakhshan, is known for sung spiritual poetry called madah. Lutes are a major part of Ismaili folk music. Lutes are important in Pamiri music, especially the three-stringed shortneck lute played with a wooden plectrum. This is called the rubab-i pamiri. Other instruments include the nay, a kind of flute, and the ghijak-i pamiri, a spiked fiddle. The circular frame drum, daf, is also common, as is the accordion, brought by Russians. ↑ Constitution of the Republic of Tajikistan, November 6, 1994, Article 2. ↑ According to the law signed on Oct. 6, 2009, government documents must be written only in Tajik AFP, Tajikistan drops Russian language, risks Kremlin's ire, Oct 7, 2009. Retrieved October 24, 2011. ↑ Radio Free Europe/Radio Liberty, Tajikistan Drops Russian As Official Language, RFE/RL, 7 October 2009. Retrieved October 24, 2011. ↑ 4.0 4.1 Central Intelligence Agency, Tajikistan The World Factbook, October 18, 2011. Retrieved October 24, 2011. ↑ 5.0 5.1 5.2 5.3 Tajikistan. International Monetary Fund. Retrieved October 24, 2011. Tajikistan Countries and Their Cultures. This page was last modified on 12 November 2015, at 15:37.